Hello there! My name is Marietta. Owning my own quilting and sewing store has always been a dream of mine. My love for sewing started when I was a little girl watching my mother sew. Years later, I realized that I could use the experience I gained to turn my passion into a business. After some big life changes and a re-location, I started working at a local independent vacuum and sewing dealer…fueling the idea to open my own shop. Today, I am so blessed to work in an industry where I associate with creative and talented people everyday! 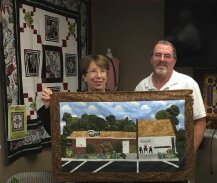 With the support of my loving husband John, my three grown children and three wonderful grandchildren (for whom I love to sew for) and the help of God, I look forward to many more years of serving the sewing, quilting and embroidery enthusiasts of South Carolina and the surrounding communities!